Hi friends! One of things I want to do with this blog is introduce you to some children's musicians. That way you can find some fun recordings, go to concerts, and throw awesome birthday parties. A couple weeks ago I was invited to a conference for children's recording artists, so if this interests you, be sure to share my blog so I can justify going. Today I am excited to introduce you to The Guitar Man, John Henry England, a children's musician out of D.C. who knows how to get kids moving, imagining, and experiencing pure enjoyment of music. I met John after a performance at our local library. It was SO much fun, you guys! He generously provided me with two of his CD's which have been a huge hit at my house, and which I will review for you here. I will be giving away two of his CD's when we hit 100 Facebook likes. We are so close, so share Motherhood and Music with your friends! The little gray boxes at the end of the post make this easy. 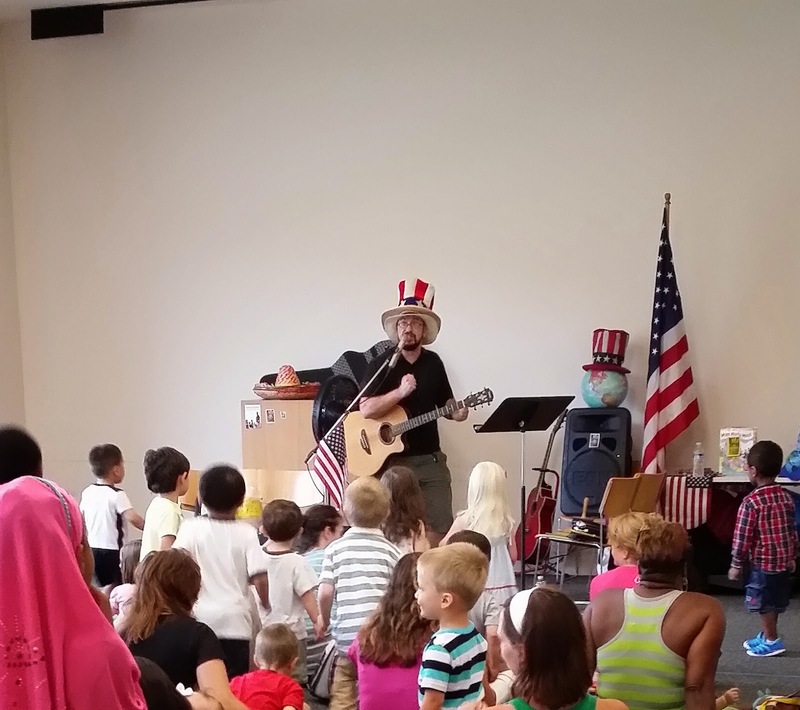 John Henry's performance was part of a library program geared toward children ages 0-5. It was just the right blend of comical (silly hats, anyone? ), interactive, and creative. He took the kids on a musical journey around the country, had them jumping up and down on pretend trampolines, and incorporated movement with upbeat renditions of American folk songs. Most of his songs are done in a punk rock style, and while I might look to other genres for teaching certain musical concepts, what children in this age group need for their musical development is to internalize a beat through movement. John's music is perfect for that! Kids would call it a fun, energetic dance party. Educators would call it multicultural, interdisciplinary, and kinesthetic learning. Listening to John Henry's albums made me wish I could go back in time and have him as my elementary music teacher. In fact, if I ever teach elementary school music again, I will do it differently because of what I heard on his CD's. Brand New Traditionals is an album full of American folk songs made relevant to today's American children. Where "Old Susanna" once involved a man from Alabama with a banjo on his knee, in this album he comes from Costa Rica with la guitarra. Traditionals like "She'll Be Coming Around the Mountain", "I've Been Working on the Railroad", and "Erie Canal" are reworked into uptempo punk rock tunes perfect for toddlers and preschoolers who are developmentally able to move accurately only to faster beats. For DMV locals, there are songs about the metrorail, D.C., Virginia, and Maryland. The second album Everybody Stand Up! is full of songs designed for movement. If you want to energize your kids, have them dance to one. If you want to tire them out, play the whole album. "Dance Dinosaurs" (a freeze dance song) has now been stuck in my head for days. I'm pretty sure "Jump Around" is Gummy's favorite. "I've Been Running" teaches the days of the week in Spanish, and "One Plus One" covers simple math. Several of the songs include instructions for dancing, which is a great way to get your kids to practice their listening skills (or to test them out if you're not sure whether they have hearing/comprehension problems or have just been ignoring you :). These albums provided great indoor dance parties on some very hot days this summer. My 2-1/2 year old loved it! I can also see them being great for a classroom teacher who wants to energize his/her students or give them a chance to move between activities. 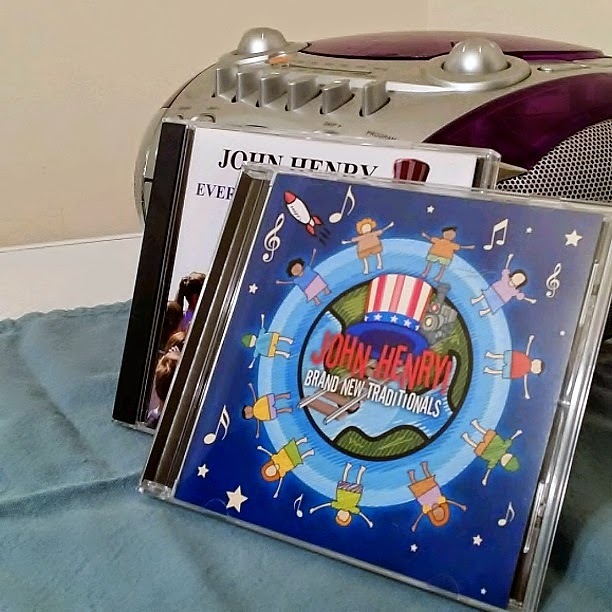 John Henry England's music fills some important needs for children of our time: the need to move, the need to feel connected to our culture and history, and the need to express through music. Hear samples and download tracks for 99 cents here. For a performance schedule, free streaming, and details on hiring for private parties, visit John Henry's website.